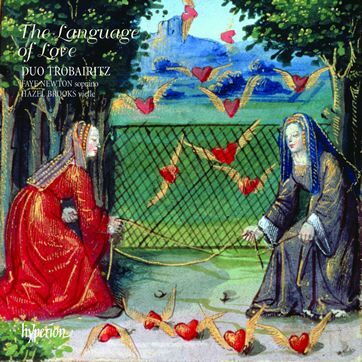 The pain of unrequited love, the pleasures of spring, foiled seductions and cruel husbands, and the chivalry of serving a liege-lady: in this recording Duo Trobairitz explore different aspects of love as depicted in the music and poetry of the 12th- and 13th-century troubadours and trouvères. The concept of courtly love began in southern France during the twelfth century. Celebrating an idealized form of love or sexual passion, it developed into a sophisticated and aristocratic code of behaviour. The courtly love ethic spread rapidly through European court society and the music became extensively varied, developing different genres. Duo Trobairitz give examples of the canso (a song that speaks pleasingly of love), the alba (a dawn song, in which a lovers’ tryst is interrupted by the coming of dawn), the pastourelle (usually about the attempted seductions of a peasant girl by a knight) and other styles, by turns humorous and tragic. Duo Trobairitz are Faye Newton (soprano) and Hazel Brooks (vielle) and The Language of Love is their debut CD. They interpret medieval music in a way that is true to its historical roots while being entertaining and meaningful for a modern-day audience. They take a melody and a text, and, through a combination of scholarship and imagination, bring the meaning and emotion of the text to life. This disc is a delightful introduction to this rich repertoire.